And so on and so forth. What all of these factors have in common is that they all reflect a clean and healthy mouth. When asked what you think it takes to avoid tooth loss and the need for Houston dental implants, you wouldn’t be wrong to say regular and thorough brushing and flossing and appointments with the dentist every six months. But there is quite a bit more to maintaining a beautiful and healthy smile. Every day, we indulge in habits that are wrecking our teeth, whether we are aware of it or not. Avoiding the need for Houston dental implants therefore requires that we wise up to these habits and start weaning ourselves off of them. In this four-part article series, we will do just that! Read on to find out about the top 19 habits that could see you requiring Houston dental implants. Ice… it’s nice and cold, it doesn’t contain any sugar and it feels good to slurp on during a particularly hot day. Harmless, right? Did you forget what happened to the Titanic? 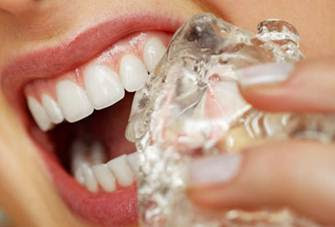 Crunching, munching and chewing on ice are terrible for your teeth. Ice is incredibly hard and it can crack and chip the enamel of your teeth, leaving the more vulnerable dentin and pulp chamber exposed to bacteria. Damage your pearly whites with ice and you could end up requiring a root canal procedure to sterilize the insides of an infected tooth or, worse, Houston dental implants to replace the irreparably damaged tooth/teeth. Recommendation: Realize that chewing ice is a bad habit that damages your teeth. Chew sugar-free gum instead. Your tongue is an organ with Attention Deficit Disorder. It sits there in your mouth, bored for most of the day, except at meal times and when you engage with your friends for a bit of a chin-wag. Otherwise, it is constantly looking for things to do. Now you have a lip stud or a tongue piercing put in. And your tongue is like a kid set loose on a playground. Try to discipline your tongue not to play with your piercing and you will find it doing so of its own volition. So, where’s the harm in this? A part of your tongue’s playing with this new fun toy involves it knocking against your teeth and/or of you biting down on the metal stud. The flat metal disk can also rub away at the gums causing physical trauma to this soft tissue, which, in the long term can compromise the tooth, ending up with you requiring Houston dental implant. Recommendation: If you really want a tongue or lip stud, talk to your dentist first and perhaps they can advise a location for the piercing that will minimize the long term damage to your teeth and gums. Tooth loss and the need for Houston dental implants is a hefty price to pay just to be trendy! 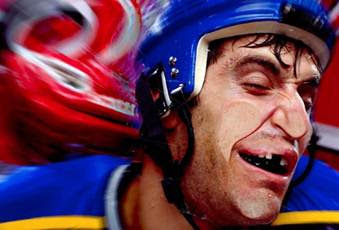 If you regularly play contact sports, such as hockey, basketball or football, either buy a self-fitting mouth guard from a sports store or have one custom-made by your dentist and wear it! This molded plastic will help to prevent your teeth and gums from sustaining any physical trauma in the event that you receive a ball, hand or foot to the face. You need only watch some international sporting events to appreciate how frequently athletes can and do require Houston dental implants! Recommendation: If you want to avoid chipping teeth, torn up gums and even the need to replace missing teeth with Houston dental implants, wear a mouth guard each and every time! Oral healthcare should begin as early as possible. And this means refraining from giving your tiny tot a bedtime bottle of formula, milk or juice to fall asleep with. Overnight, your baby’s emerging teeth will be bathed in sugars and this can lead to early decay. Recommendation: Don’t get your baby used to falling asleep with a bottle. Feed them before you put them to bed in their cribs. To read about more habits that could, one day, see you requiring Houston dental implants, stay tuned for the second installment of this four-part article series.